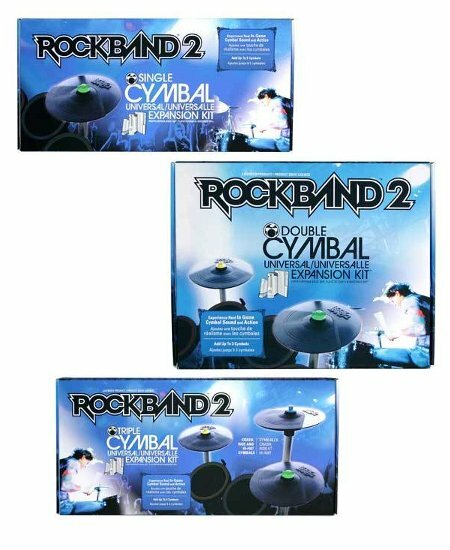 The Officially Licensed Rock Band 2 Cymbal Expansion Kit from Mad Catz lets you drum like the pros do. With the easy-to-install mounting bracket, you have total control and can setup your drum kit in any configuration you see fit. The color-coded wing nuts let you mount and configure to any available cymbal you wish to use: yellow for Hi-Hat, green for Crash, and blue for Ride. Simply attach the velocity-sensitive cymbal and corresponding wing nut to match your connection then attack your song library with new vigor to achieve the next step in drumming perfection. Choose from our Single, Double, and Triple Cymbal Expansion Kit options.